The website is always changing, so come back often! If you've never been here before, browse around the site. Most importantly, we would love to see you one Sunday at 10:45 for worship service. Come early for coffee and snacks, or attend a Sunday School class at 9:30. We have different ones for all ages. This is the place for you! It doesn't matter if you're young or have been around the block a few times. 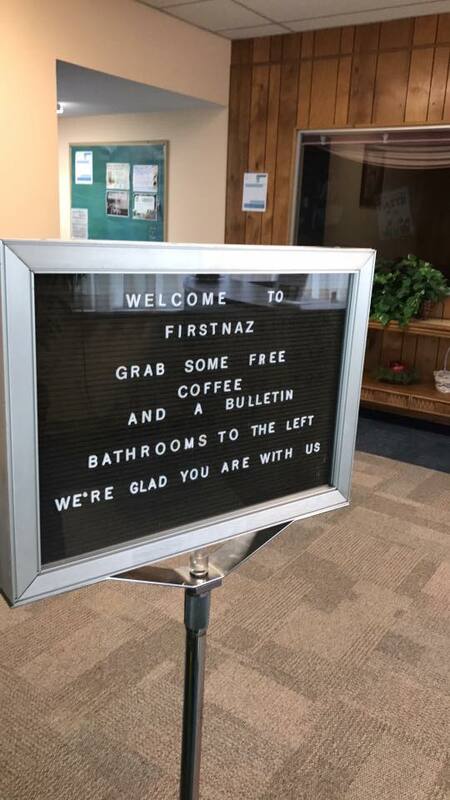 FirstNaz is a great place to call your church "home." We are a church of all ages and backgrounds, united around one common goal: We want to be better people. Honestly, we have come to believe that this will only happen by the power of Jesus Christ in our lives.